We’d love your help. Let us know what’s wrong with this preview of CHACHA CHAUDHARY DIGEST 20 by Pran Kumar Sharma. Once cartoonist Pran struck upon an idea of a wise oldman who solves problems with his sharp intellect. Thus CHACHA CHAUDHARY was born in 1971.Tall and robust SABU, who is an inhabitant of planet Jupiter, gave Chaudhary an ideal company. A combination of wisdom and strength was formed to tackle any difficult task. It is said that " Chacha Chaudhary's brain works faster tha Once cartoonist Pran struck upon an idea of a wise oldman who solves problems with his sharp intellect. Thus CHACHA CHAUDHARY was born in 1971.Tall and robust SABU, who is an inhabitant of planet Jupiter, gave Chaudhary an ideal company. A combination of wisdom and strength was formed to tackle any difficult task. It is said that " Chacha Chaudhary's brain works faster than a computer". Though both fight the criminals and tricksters, each episode ends with a touch of humour. The duo perform in lighter vein. The CHAUDHARY family consists of his wife Bini, a fat sharp tongue woman, Sabu, Rocket - the dog and Dag- Dag, an old truck who is half human- half machine. 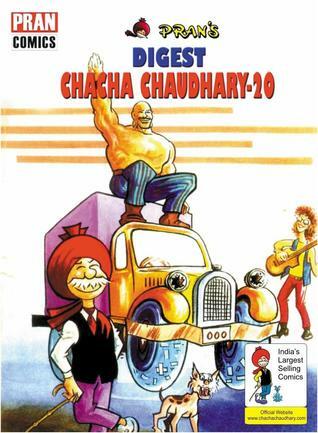 To ask other readers questions about CHACHA CHAUDHARY DIGEST 20, please sign up.